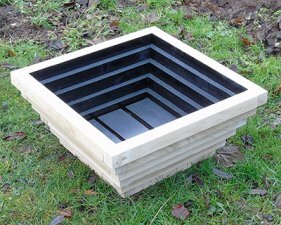 The Lichfield garden planters measures 55cm by 35cm and weighs 6kg. 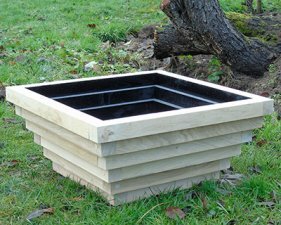 A mid size wooden planter suitable for a specimen plant, a small shrub or a seasonal planting. 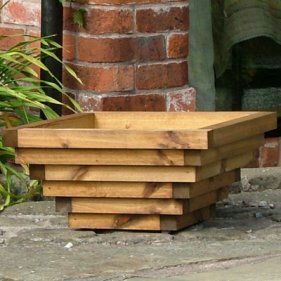 These garden planters are made from lengths of 4.5cm x 4.5cm planed Scandinavian red pine or British grown oak. The interlocking nature of the design, produce an extremely attractive, strong planter. 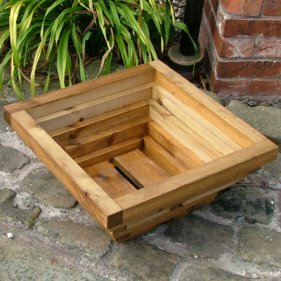 These garden planters are finished with a good quality, plant friendly preservative when manufactured from Pine. When manufactured in oak they are either left natural or finished with teak oil. The internal walls of these planters are now painted with a waterproof paint sealant. Transport yourself to another land with displays inspired by foreign influences. The oriental look is well suited to planters since it uses few plants and limited colours. In planters you can also create the perfect conditions for exotics that would normally be unattainable. The Chinese and Japanese have been growing plants in planters for centuries. Their planters are normally planted with shrubs and trees. Pines, bamboos, Acers, evergreen azaleas and camellias are all good subjects for an oriental display. settings for a collection of planters for oriental style and are easy to incorporate on a balcony or patio. Wooden planters can be used very effectively. Painted or stained in natural shades or with their slats coloured to echo the colours of your plants. Low level trough planters can also be utilized for a profusion of trailing plants that are wonderful for scattering annual seeds that will give a delightful free flowing effect. Using your planters to create a Mediterranean feel to your garden. To achieve a more exotic feel for summer, re-create a Mediterranean look with citrus trees in planters, or flowering shrubs, such as a Bougainvillea. Whatever look you choose, the key is to create a complete design. A single exotic display in an ordinary garden would look bizarre. It is better to include the odd unusual plant in a more homely arrangement, for example, placing a yellow-stemmed bamboo by a pond among other water loving plants. Or devote a whole section of your garden to your design.